Arriving to the embassy was frightening and we almost decided to get our visa in Bishkek just by looking at the shouting crowds outside, however after we pushed past our fears it was one of the easiest embassies to get a visa. However if you are a foreign passport holder you stand a chance to avoid all this mess. Wave your passport in the air saying your country of citizenship, just shouting, “Excuse me”, likely won’t help. For some reason foreigners get to the front of the line so make sure the Consul or guard(s) have noticed you. Also having a baby with you usually moves you to the front of the line however everyone seems aware of this and somehow everyone has a baby… so making sure they know you’re a foreigner is the best way to get to the front. Working days of the embassy are: Monday, Tuesday, Thursday and Friday. Do not leave your passport with them, many foreigners do this because they are used to having do this and don’t understand what they are saying. You only need to leave your passport with them for the 15 min it takes them to put in the visa. Come back in 7 days, pay 75 dollars (for most European countries) through the bank (they will give you the requisites of the bank), bring back the receipt to the Embassy, wait 10-15 min and pick up your visa. 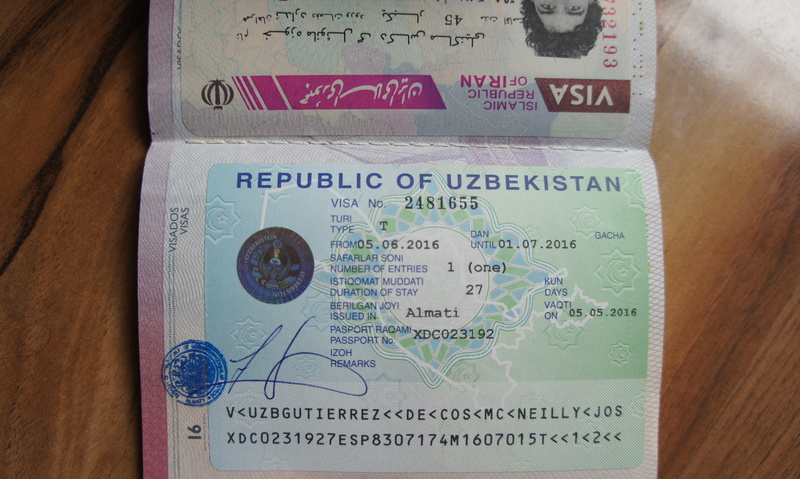 It is possible to get tourist visa to Uzbekistan for 7,15, 30 days, 3 months, 6 months or 1 year. Citizens of Austria, Belgium, Czech Republic, France, Germany, Italy, Japan, Latvia, Malaysia, Spain, Switzerland, Thailand, UK and USA do not need a letter of invitation (LOI) to apply for their Uzbekistan tourist visa. Citizens of Kyrgyzstan, Armenia, Azerbaijan, Belarus, Georgia, Kazakhstan, Moldova, Russia and Ukraine do not need visa to entry the country. All other nationals need LOI from a tour company. Once you have LOI you can get visa the same day. Visa is date-specific. It means that dates of entry and exit are set on the visa. However you can enter and leave anytime within the dates you select. For multiple entries add 10 dollars per each entry. Usually visa is issued in 7 days. For an expedited visa (3-4 days) they will charge you 50% more of consular fee + 15 dollars actual expense. For citizens of USA it is 140 dollars per visa and 210 for an expedited one. Children under 16 years old do not pay consular fee (however still might pay 15 dollars for the visa fee). From our own experience we had our visa in 10 days because of the May holidays in the country. Also when filling out the form we didn’t have anything booked so we just put a random hotel address from booking.com and were approved with no questions. 7-10 days may sound like a long time however there is plenty of stuff to do around Almaty and in Southern Kazakhstan. We visited Sharyn Canyon, Turkistan, ruins of ancient city Sauran, went to the beautiful mountain village Kaskasu just 60 km southeast from Shymkent. So these 10 days we had was barely enough to do all of it!